Brazilian Independence Day is September 7 and it is celebrated each year on the banks of the Charles River in Brighton/Allston, Massachusetts. Organized primarily by the Brazilian Women's Group, this outdoor festival draws from a growing Brazilian population in the Greater Boston area. The main performance stage is dressed in a banner of green, white, and yellow braided balloons, celebrating the colors of the Brazilian flag. In addition, there are booths for community organizations, vendors selling Brazilian commercial items such as flags and soccer jerseys, and vendors selling Brazilian food. The formal festival program begins with the singing of the Brazilian national anthem, introductions of organizers, and other special guests, all in Portuguese, with much of it translated into English. 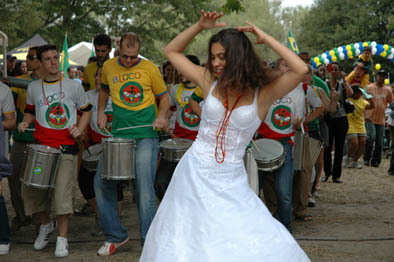 In 2007, the festival featured, BatukAxé, a Boston area percussion ensemble led by Marcos Santos, a native of Salvador, Bahia. The group is dedicated to the preservation and promotion of the vibrant Afro-Brazilian Carnival traditions of Bahía, a state in northern Brazil where 90 percent of the population is of African descent. The region's Carnival music is rooted in the Ax é rhythms, which emerged from Candombl é, a religion practiced by Brazilian slaves. Unlike the more well known Carnival traditions of Rio de Janeiro with its huge floats, parading samba schools and thousands of spectators, Carnival in Bahia is far more inclusive and participatory. As the carnival clubs parade throughout Salvador, they pick up revelers promoting the traditional notion that Carnival is a time to join in, a time when rules can be broken and social barriers crossed. Marcos Santos and BatukAxé brought a taste of this revelry to the 2007 festival. Costumed characters and the musical ensemble led a parade of festival goers, constantly encouraging the general population to join in. The procession grew and wound its way through the festival grounds. The culminating event was the boi bumbá, or traditional Brazilian ox dance. This pantomime performance with its handcrafted costumes, masks, music and song, is a centuries old comic dramatic dance and street performance which tells the story of the birth, death, and resurrection of an ox.